Anyone replaced Hankook DynaPro ATM with Michelin LTXM/S2?? I've had totally the opposite experience. I'm super impressed with the Hankook's. I just rolled over 7,700 miles on my '15 and had them rotated and balanced yesterday. They're a great tire and when these wear out, I'm highly likely to rebuy them. The ride is great, and I love the way they handle in rain/snow. For the price difference as opposed to the Michelins, it's a no brainer for me. As a side note, I went to Discount Tire and paid them to assume the warranty for my tires. Cost was $97 and now I don't have to deal with the dealership for anything tire related. Win/Win! Yeah I like my Dynapros a lot and I rarely ever go off road. A gravel parking lot is about all my truck will see. I was browsing tirerack.com a while back and noticed how much cheaper the Dynapros were than many other brands...like significantly cheaper. When these babies where out a replacement set us going right back on. Living in KY is see 4 seasons and plenty of rain. I've found the tires to work out just fine for me. I run mine @ 37 psi. Improved gas mileage AND ride... best tire for a full size truck. Period. My 15' XLT has the Hankook 265/60R18 BSW all season tires. I have 14,000 miles. Surprised and pleased with the smooth quiet ride and well handling in rain. 37 psi with one rotate at 8,000. When I need tires I'm considering the Good year assurance. I have them on my wife's CRV. Her car got smoother, quieter and handles much better than the original equipment Bridgestone duelers that wore down to the wear bars at 19,000 miles. It had the alignment checked twice at my insistence. The GY assurance went 75,000 before replacement. Second set of GY's going strong at 140,000. Mileage is also a little better with the GY's. Hope this helps. I had a set on my 2007 FX4. The Michelin tires wear like Iron. You can put a lot of miles on a set with correct rotation. They may make a little more noise.,but a very good choice. 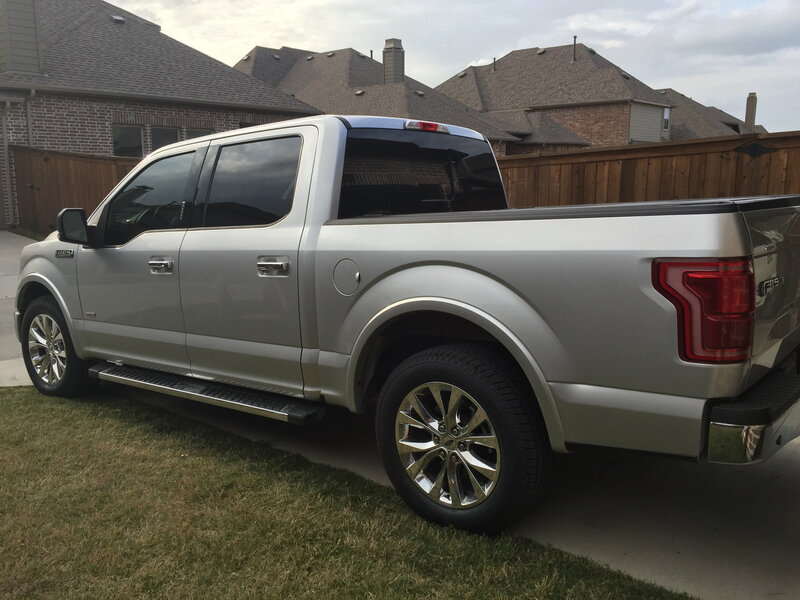 My New 2015 FX4 Platinum came with the 20" Hankook. They ride smooth as Glass on the Highway. I only have about 560 miles on them so far.. The tread looks more aggressive than I've had in the past with new F150 4x4,s.. The verdict is still out. The 20: Hankook run with 40 psi. I rotate my tires at every Oil change which is every 3 months, regardless of miles. Last edited by Platinum T.C. ; 07-07-2016 at 12:29 AM. Send a private message to Platinum T.C. Find More Posts by Platinum T.C. You guys with the 3.31 gears and the Michelins how does your truck handle the extra weight? I love the look of the Dynapro ATm. I have no problems with them performance wise as well. Still debating if I have to change it with a taller Dynapro 275/60R20 next time. Quick Reply: Anyone replaced Hankook DynaPro ATM with Michelin LTXM/S2? ?